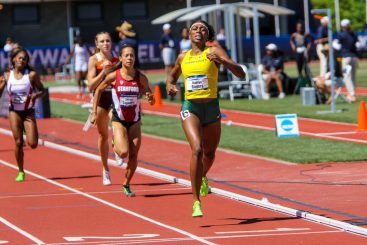 Jenna Prandini and Raevyn Rogers led the Oregon Women’s Track & Field Team to its first NCAA title in thirty years Saturday, sealing a rare double win for the Ducks’ track program. The Ducks’ men’s team took top honors in action completed Friday. The women were not as dominant as the men, who demolished the field with a 29-point win, but they came through when it counted, and what promised to be a fight to the finish ended with a whimper with two events remaining rather than going down to the final relay. The day got off to a rough start for the Ducks when the 4 X 100 relay was disqualified due to a faulty exchange. It was a loss of three valuable points, but the blow was softened by Texas A & M’s failure to win the event, which left two points on the table for the Aggies. The Ducks were hoping for points from freshman Nikki Hiltz in the 1500, but she came up short of scoring, and the duel with Texas A & M was seemingly on. Jenna Prandini racked up a first and two seconds to lead the Ducks. Momentum shifted in the Ducks’ favor in the 100. The Aggies had two finalists to Oregon’s one, but Prandini overcame a slow start to take the race — and ten valuable team points — in a rapid 10.96 seconds. The Aggies managed only five points with fifth and eighth place finishes, and Oregon’s chances for total victory brightened. Enter freshman Raevyn Rogers in the 800. Track & Field News had her penciled in for fourth place. She entered the finals with the seventh-fastest semi-finals time. 2013 800 champion Natoya Goule of Clemson blazed the first 400 in 56 seconds, inviting the Oregon freshman to make a deadly tactical error. But Rogers wisely held back and waited for the second lap, reeling Goule in on the backstretch and nailing down the win in 1:59.71, a two-second PR and a mere six tenths short of the meet record. More importantly for the Ducks, Rogers put Texas A & M in a big hole. The Aggies were down to one chance, and that was to have their two entries in the 200 carve up Oregon’s Prandini, who, running her third race in less than two hours, had to be getting a little tired — or so the Aggies hoped. Raevyn Rogers closes a big win in the 800 meters. Prandini raced to a second-place finish in 22.21 — one of the top times in the world this year. The Aggies finished third and sixth, and it was game over. With 59 points, the Ducks had a 24-point lead over the Aggies, who could score no more than an additional 20 points with their two remaining entries. Meanwhile, Kentucky had slipped into the number two team slot with 50 points, but had no remaining opportunities to score. The Aggies needed a fourth place finish in the 4 X 400 relay to draw even with Kentucky, but managed only a seventh, bringing them up to 47 points and a third place team trophy. Arkansas (43 points) and Georgia (41 points) rounded out the top five team finishers. Taking four of the top five spots was an impressive show for the SEC, but the day — and the week — belonged to the Oregon Ducks and the Conference of Champions.